★ TIME PRODUCTIVITY - Quarter-hourly appointment times 7: 00 am to 8: 45 pm, Monday - Sunday. Past and future monthly reference calendar, weekly goals, TO-DO list and end of week review included in the weekly schedule pages. ★ QUICK-TABBED MONTHS - Each month can be separate with tab stickers. January - December 2019, featuring 53 weeks of weekly pages with julian dates. 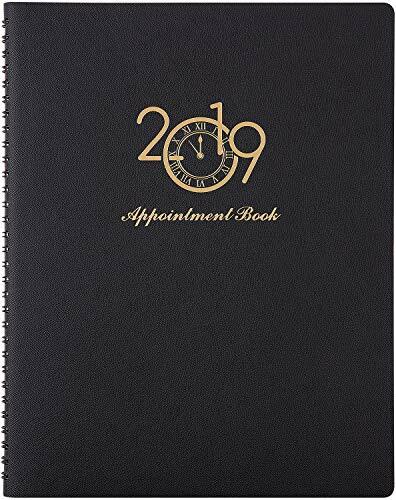 ★ SPECIAL DESIGN - Semi-concealed wire binding/2019 - 2021 yearly holidays/2019-2020 calendar overview/January - December 2019 yearly overview included in this planner. ★ PREMIUM QUALITY - Faux skid resistance leather soft cover planner 2019, excellent texture. Off-white paper planner can adequately protect your eyesight. No pollution, acid-free, environmental. ★ WEIGHT REDUCED - Reduced weight and soft cover portable design which can be easily placed in backpacks, easier to carry no matter where you go, 8.5" x 11".